Disputes between landlords and tenants are very common and often frustrating. When a landlord has a tenant who stops paying rent, damages the landlord’s property, or honor the terms and conditions in the lease agreement, the landlord is sometimes left with no alternative by to start eviction procedings. In other situations, a tenant may have been wrongfully or improperly evicted and may need to seek legal counsel to protect his or her rights. The landlord tenant law attorneys at KALIS, KLEIMAN & WOLFE regularly represent residential and commercial, landlords, owners, managers, tenants, builders and others in evictions matters, lease disputes and litigation. We regularly handle evictions and unlawful detainers, post-foreclosure evictions and defense, collections, litigation and more. If a landlord who wants to keep the security deposit doesn’t notify a tenant in writing within 30 days of the move, the landlord must refund the full amount of the deposit. Landlords also need to include statutory language regarding the security deposit dispute procedures in all leases beginning Jan. 1, 2014. If a tenant violates a lease provision – such as not paying rent on time or having a pet – and doesn’t correct the problem after receiving a seven-day notice to do so, the landlord can move to evict after the seventh day without providing any further notice. Landlords can accept partial rent payments and still move to evict in the same month – provided that the landlord gives the tenant a receipt for the partial payment, places the partial payment in the court registry if an eviction is filed or post notices informing the tenant that he or she must pay the amount due or vacate within three days. If a lease requires a tenant to provide up to 60 days’ notice to vacate, the landlord must also provide up to 60 days’ notice that the lease will not be renewed. Carefully following legal procedures is necessary to protect both the tenant and the landlord/property owner. 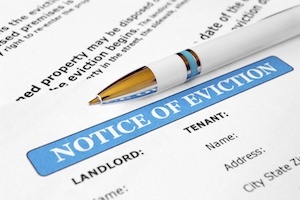 Evictions can be complex and emotional, and errors may cause costly delays, and property damage and other possible liabilities may be incurred (ex. monetary judgments against a landlord for wrongful eviction). The attorneys at KALIS, KLEIMAN & WOLFE often assist clients in the drafting, negotiating, or signing of a lease, to help landlords and tenants understand their obligations created by the lease document or to help them include the necessary provisions before they are confronted by unexpected surprises. If you are a landlord looking to evict a tenant, or if you are a tenant who is facing an eviction and believe you are being wrongfully evicted and want to understand your legal rights, contact the experienced Commercial Litigation Attorneys at KALIS, KLEIMAN & WOLFE, the South Florida-based law firm today at (954) 791-0477.